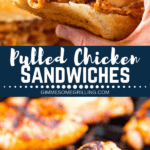 Tender grilled chicken thigh meat that is pulled and then combined with a Root Beer BBQ Sauce to make delicious Pulled Grilled Chicken Sandwiches perfect for entertaining! Such a delicious and easy grilling recipe for everyone! 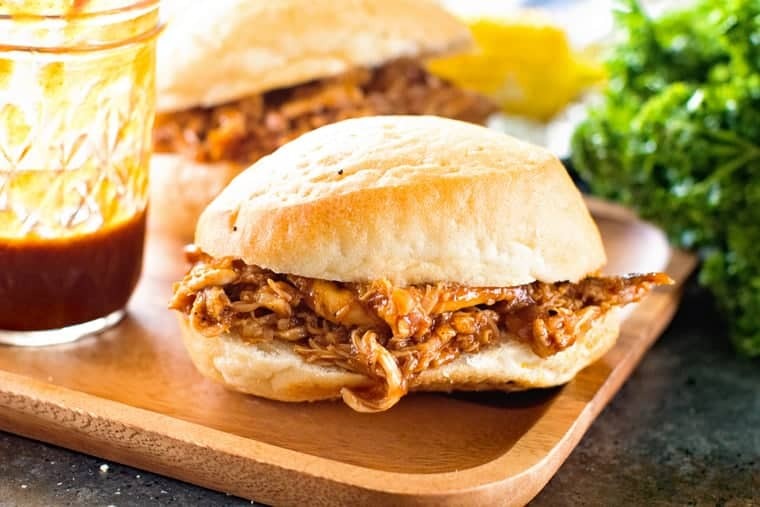 Throw some chicken thighs on the grill that have this amazing BBQ Chicken Rub on them then shred your meat, top it with Root Beer BBQ Sauce and you will have these delicious Pulled Chicken Sandwiches! It’s such a fun twist on grilled food to keep things fresh. I encourage you to double or triple the amount of chicken thighs you grill, shred them and then you are prepared for the week. You can through it on your salads, top some nachos with it or even make a loaded baked potato and throw the shredded chicken on top. Really the possibilities are endless and now I want to go make more pulled chicken to top all the things with it! I’m always amazed at all the different things you can grill. Before I started this grilling blog I had it stuck in my you could grill hamburgers or chicken breasts. If things got really crazy I might throw a few kabobs on the grill and go from there. I was certainly not adventurous when it came to grilling. In fact, I didn’t even grill. That’s right, I made my husband do it! Then I got this wild idea to start a grilling blog, bought a new grill (which I ADORE) and went to work. I honestly think I never grilled because we had a cheap grill and I was always frustrated because there were so many hot spots and it was a challenge. With my new grill it’s a dream. None of that going on so I get perfectly grilled meat all the time. Plus, it’s big enough I can easily triple this batch of chicken thighs and even throw on a side dish and/or dessert to go with our meal! Score for making the entire meal on the grill. That typically means less dishes for me and I’m all about that for sure! 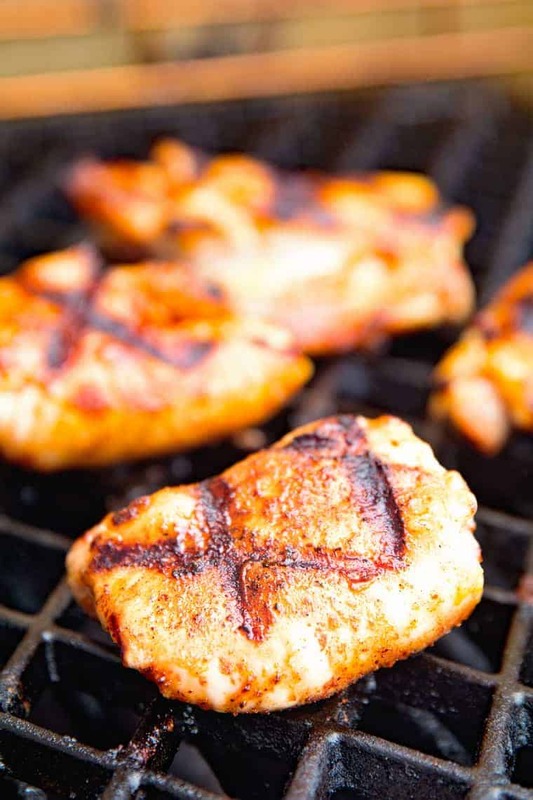 What should the internal temperature of grilled chicken thighs be? The internal temperature of cooked chicken should be 165° Fahrenheit(75° Celsius). A great way to know this is by using a meat or instant-read thermometer (this is my favorite) to determine the temperature of your chicken, and if you’re cooking a whole bird, it should be inserted into the thickest part of the thigh but not touching bone. When cooking chicken breasts and chicken thighs always remember to insert it into the thickest part of the portion to determine the temperature of the meat. 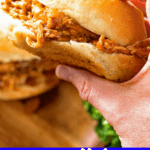 The first thing you want to do is prepare your grill by heating it to medium heat about 350 – 400 degrees F. You will be using direct cooking for these pulled chicken sandwiches. Next you want to brush your boneless, skinless chicken thighs with olive oil and then season evenly with BBQ Chicken Rub. Grill the chicken thighs for 8-10 minutes flipping once or twice during cooking. You will want the juices to run clear and meat to be firm to the touch. The internal temperature should reach 165 degrees F when they are cooked through. Remove them from the grill, wait 3-5 minutes or until you are able to handle the chicken thighs and shred the meat. Combine with Root Beer BBQ Sauce in small sauce pan and heat through. 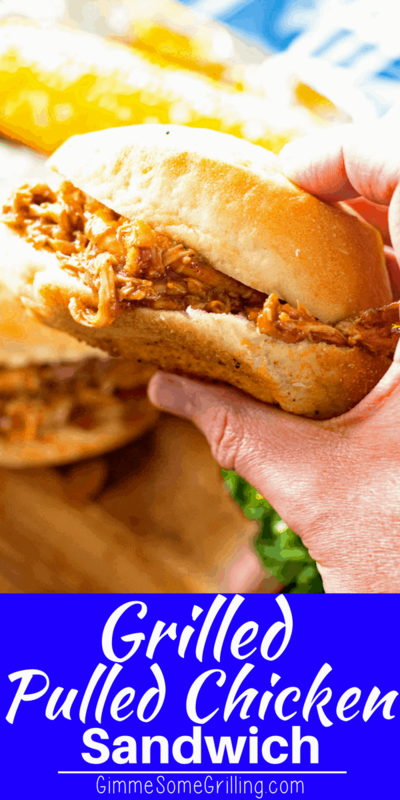 Fill buns with your pulled chicken and enjoy! Prepare the grill for direct cooking over medium heat about 350 - 400 degrees F.
Lightly brush the chicken thighs on both sides with olive oil and then season evenly with the BBQ Chicken Rub. Remove from the grill and let rest until cool enough to handle. Shred the chicken, add the Root Beer BBQ Sauce and heat in sauce pan until heated through. 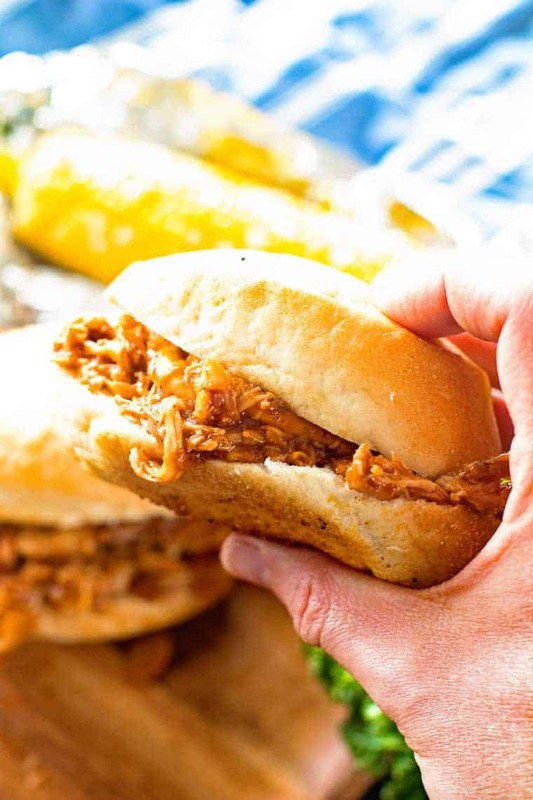 Fill buns with the pulled chicken.